Saturday’s UFC Belem event is in the books, and now that the dust has settled in Brazil, it’s time to go to the scorecard to see who the big winners were at Arena Guilherme Paraense. Unfortunately, referee Mario Yamasaki’s late stoppage of the UFC Belem co-main event between Valentina Shevchenko and Priscila Cachoeira has garnered much of the post-fight chatter, but let’s not forget the performance of Shevchenko in her UFC flyweight debut. And that performance can be summed up in one word: Wow. From the time the two fighters were waved together to scrap, “Bullet” was on target with everything she attempted. Her strikes were quick and accurate, her grappling was top-notch, and her ground-and-pound was vicious. In a new division for the UFC, Shevchenko has delivered THE most impressive effort yet, and moving forward, she has to be favored against any 125-pounder she faces. Did I say wow, yet? Win or lose, I will always watch Thiago Santos fight, because he never shows up to get a paycheck. He’s got a kill or be killed approach to the fight game, and since his submission defeat to Eric Spicely in September 2016, he’s been doing the proverbial killing, winning four in a row, all by knockout. Saturday’s finish of Anthony Smith is just the latest chapter in an intriguing story “Marreta” is writing, and he’s certainly earned a crack at a top contender at 185 pounds. And while he came up short the last time that happened against Gegard Mousasi, I have a feeling that kind of lightning won’t strike twice. 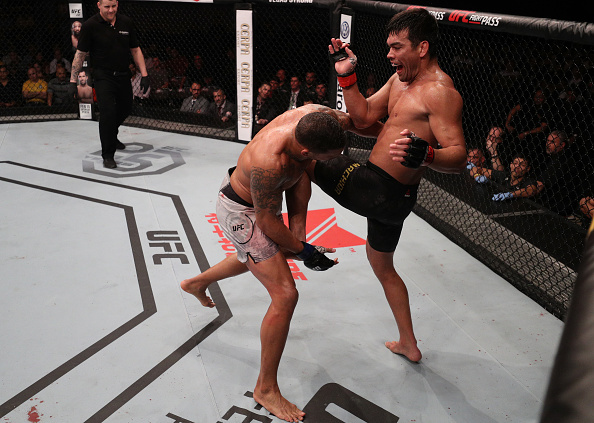 Legendary boxing trainer George Benton famously told one of his fighters after a victory that wasn’t exactly exhilarating that “You win now, look good in the next one.” Lyoto Machida needed a win on Saturday night against Eryk Anders and he got it. It was close, some would say controversial, but “The Dragon” got the job done and his hand was raised for the first time since December 2014. That’s a long time to go without a win, especially for a former world champion like Machida. So now that he got what he needed – a win – he can move forward with a little less weight on his shoulders. Eryk Anders, in his third UFC fight, traveled to the hometown of a former world champion and came within one judge’s scorecard of beating him. And many believed the former University of Alabama football player did deserve the nod. That’s impressive for a young man who had the stones to call out Lyoto Machida with just 10 pro fights heading into last weekend’s bout. He’s only going to get better, and he already proved that he belongs with the best at 185 pounds. I don’t know if Iuri Alcantara will ever challenge for the UFC bantamweight title. But after nearly seven years on the UFC roster, it’s time to give the man his due. On Saturday, “Marajo” scored his 10th win in the Octagon, and he did it in style, knocking out Joe Soto in 66 seconds. He has now ended his last three wins by knockout or submission over Soto, Luke Sanders and Brad Pickett, and while those victories surrounded losses to Brian Kelleher and Alejandro Perez, Alcantara’s UFC resume should serve as an example to younger competitors of what it means to be an honest fighter and a true pro. Well done, Mr. A.